Moving to New York was one of the boldest and best decisions I have ever made. Instead of settling down and joining the corporate grind, in my early 20’s, I packed up my guitar and my Joni Mitchell songbook and took off for the big city. It was rough in the beginning but I learned quickly how resourceful I could be when rent was due and my bank account was empty. I was young with no kids or mortgage to stress over so the sky was the limit in terms of my social life. I worked in restaurants primarily so after a shift I would head out with the crew, and dance until my feet were throbbing. I have many fond memories of hobbling out of clubs at 6am, shoes in hand, ears ringing, and being drenched in sweat from head to toe. On the outside it looked as if I was living a big, fat life. However, on the inside, I was twisted up and tortured over an idea that still haunts me today. You see, I was convinced that I was just one more late night out or one more drink away from becoming an alcoholic. The fear itself was not irrational given that both of my parents were alcoholics and that my brothers had addiction issues since before I was born. Science had never been on my side either. “Many scientific studies, including research conducted among twins and children of alcoholics, have shown that genetic factors influence alcoholism. These findings show that children of alcoholics are about four times more likely than the general population to develop alcohol problems,” says the National Institute on Alcohol Abuse and Alcoholism. Which means that even if I default on my membership dues, I will always be a preferred member of the alcoholics club. I could just picture my future (if you can call it that) through the dizzy haze of my hungover mind. One morning I would wake up surrounded by the empty Budweiser cans that I had tossed all over the floor the night before. On my coffee table would be random blisters of dried and cracked yellow mustard. Red strips of Cracker Barrel wrappers would still be hugging the now dehydrated block of cheese balancing on a pile of cigarette butts. The transition from a hopeful 20-year-old into a slobbering drunk would be instantaneous and my greatest fear would have been realized: I had turned into an alcoholic and was just like my parents. The scene that I described earlier—the rotten cheese and Budweiser situation—was what I woke up to on numerous occasions when I was a kid and the terror of it all had obviously left a deep impression on me. In my adult life, it wasn’t my genetics that were working against me but my own mind. Was my future doomed? Was there nothing that I could do to reverse the curse? Was I a bad person because I liked to drink and enjoyed hanging out at the bar with my friends? What would people think of me if they knew my parents were alcoholics and there I was standing with a margarita in my hand? Regardless of what my genetic map says I do not, and will not, let it dictate how I live my life. The truth is I have been drunk before and that does not make me an alcoholic. I know where alcohol fits in and where it does not belong. I know that if I want to get up tomorrow and have a productive, clear headed day that I cannot sit on the couch with a bottle of red the night before. I also know that drinking in moderation is all right and if I am sitting in the sun enjoying a refreshing mint julep that doesn’t mean that I am headed down the same road as my parents. Alcohol will always put me one edge and till this day I can’t stand the sight of a Budweiser beer can and I give the Cracker barrel cheeses the stink eye when we cross paths in the grocery store. However, I know who I am and what I want out of life and addiction does not fit in the picture. I am happy to report that I still have the guitar and the Joni Mitchell songbook that I set out with when I first began this adventure. And the fear of my genetics making me alcoholic is decreasing every day. 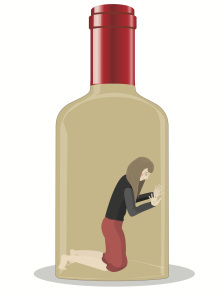 ‹ Where Do College and Sobriety Meet? Your parents being alcoholics does not mean that you are genetically predisposed to be an alcoholic. It is this misconception and stereotyping that makes addiction so hard to understand. It is the behaviors of the alcoholic that need to not be imitated. They must be recognized and obliterated if you are going to prevent addiction in your life. There are plenty of people in recovery, that don’t touch alcohol but still behave like an addict does; no self-reflection, no humility, no self-awareness, they’re closed off emotionally, and incapable of providing emotional support. The idea that the drink is the only motivating force is terrifying and it will leave us stunted in our ability to prevent addiction. It’s a complicated disease to understand but we have to first squash the misnomer that addiction is an inherited disease. It’s not true, it never was true. It’s just easier to think that, then really focus on the issues.